We had our first measurable snow fall yesterday which makes me want to make soup! This was on my "to try this year" list, and I'm getting it in just under the wire! 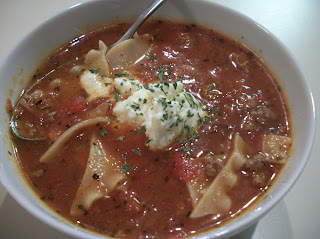 This is a great idea for a soup - all the flavors of lasagna cooked into a hot soup, with the cheesy portion getting melted in individual bowls at the end. Leftovers heat up well, although the pasta absorbs much of the liquid, so any leftovers are more like lasagna casserole, equally delicious! I love how fragrant soup is when it's cooking - you'll have lots of oohs and ahs from those walking in the house, and those sitting down at your dinner table. Served with some crusty bread, and a nice green salad if you're on a health kick, this is the perfect first snowfall soup. Or any time snow is falling soup. Find more inspiration at Fabulous, Show and Share, Clever Chicks, Create Link Inspire, Try a New Recipe, Hearth and Soul, What's Cooking, Wow Me, Wow Us, Favorite Things, Full Plate, Showcase Your Talent, Foodie Friday, Friday Frenzy. Heat a Dutch oven over medium-high heat. Once hot, crumble beef into pot, add onion and garlic, season with salt and pepper to taste and cook, stirring occasionally until browned. Drain the fat, then add the chicken broth, tomatoes, tomato paste, basil, oregano, rosemary, fennel seeds, thyme, sugar and parsley to the pot. Bring just to a boil, then reduce heat to medium-low, cover and simmer 20 minutes. Meanwhile, prepare lasagna noodles according to directions listed on package, reserving 1 cup pasta water before draining pasta. Add cooked pasta to soup along with 1/2 cup - 1 cup pasta water as desired. In a mixing bowl, using a fork, stir together mozzarella, parmesan and ricotta. Ladle soup into bowls, dollop with a large scoop of the cheese mixture and sprinkle with parsley to garnish. 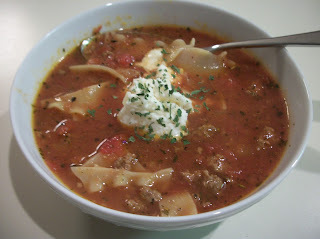 Lasagna soup looks delicious thanks for sharing with Hearth and soul blog hop, tweeting. and pinning. Your Lasagna Soup looks awesome! Thank you so much for sharing with Full Plate Thursday and have a great day.